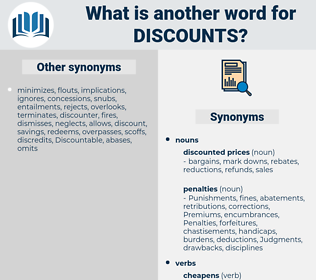 What is another word for discounts? forgiveness, remittance, Remittances, allowances, remission, Submitted, transfers, breaks, drawbacks. disagreements, costs, savings, Advertisements, contributions, concessions, credits, points, refunds, dividends, Subsidies, rates, Premiums, economics, quotations, exemptions, postponements, Incentives, Prices, Bonuses, write-downs, restraints, disputes, derogations, surrender, surrenders, submissions, reducing, saving, downgrades, cut-offs, lowering, bargains, offsets, postcards, Fees, trade-offs, decreases, tickets, write-offs, FARES, benefits, opponents, declines, expenses, haircuts, bushings, Grants, Charges, renditions, abatements, gifts, preferences, openings, reduced, tenders, quotes, efficiencies, offerings, sales, advantages, offres, emissions, inferences, Rewards, promotions, Kickbacks, sacrifices, takeovers, bids, cutbacks, bidders, pardons, saves, hands, Vacancies, specials, offers, favours, compromises, drops, prizes, packages, mergers, cut-backs, awards, privileges, reliefs, schemes, challenges, removals, deals, releases, Rivalries, Remittances, allowances, sheds, transfers, breaks. 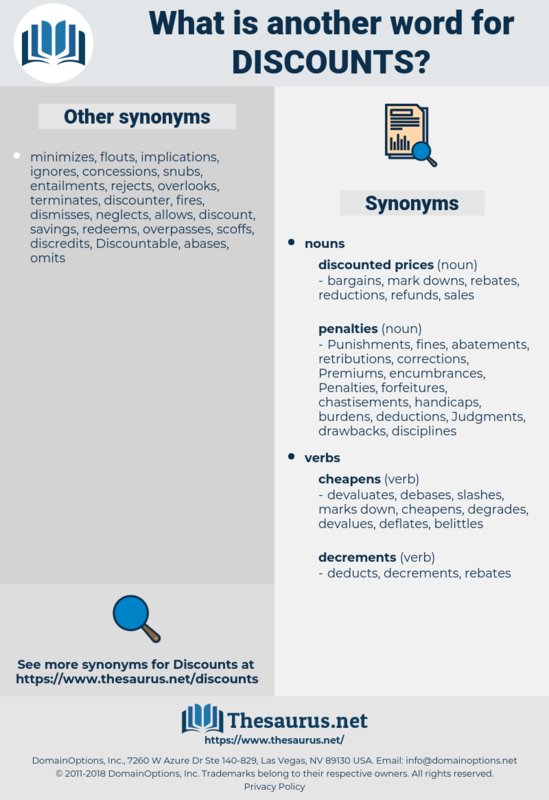 diminishes, dismisses, differs, excludes, sidesteps, eliminates, reduces, minimizes, maintains, removes, lowers, lessens, precludes, spreads, evolves, decreases, reduced. A correspondent of Pitt attributed the decline to the action of the Bank of England at the close of 1795, in reducing their discounts. desmid, dignity, disjoint, disjoined, duty assignment, disownment, Dika Nut, designed, Docent, disjointed, dehiscent, deckhand, dissonate, desiccant, dissonant, disseminate, dockhand, discussant, disunity, disunited, disowned, Deoxygenate, descent, decimate, descend, doughnut, discommode, disunite, dachshund, desquamate, detachment, descant, Djanet, decant, decent, dissent, dismayed, designated, documented, dig into, Desmond Tutu, document, discant, designate, dismount.